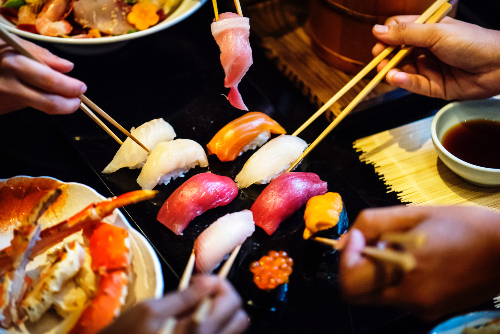 Sushi, seaweed, bamboo, sashimi, chicken Tandoori, noodles… These concepts are now very much a part of our culinary vocabulary. The truth is that Asian food has come into our lives to stay. Variety and colour are two of the distinctive traits of this broad cuisine, which has become one of the most popular in the world. Key ingredients include pulses, rice, fish and vegetables, while meat and sweet recipes are much less common. It is full of spices and strong, hot sauces. This is, without doubt, the healthiest gastronomy. If you are an Asian food fanatic, take note of these four restaurants in Madrid that we promise will not let you down. The finest Thai cuisine in Madrid. Located in an area unexplored by most tourists named Prosperidad, El Flaco is frequented by eaters who go there specially or by recommendation. The restaurant came about thanks to Andy Boman, a Swedish man who grew up in Africa and has since travelled half-way around the world. While on his travels, it was Aisan cuisine that most impressed him. Andy’s menu features dishes such as Tom Yam soup, bacon bao boiled in Cantonese broth and fried, scallops with fungi, and deserts such as brûlée, passionfruit and mango to sweeten your palate. Discover Chinese food’s Japanese sister at Madrid’s first Ramen Bar. These are the two reasons why this venue is always busy. The menu is a fusion between these two types of cuisine, featuring such emblematic dishes as ramen and dim sum. Don’t miss the Japanese noodles with bacon, Chinese spring onions and cashew nuts, the cochinita pibil bao bun, or the chicken and black garlic gyozas. The “happy Buddha” is the longest‑standing Chinese restaurant in the Spanish capital. Diners are welcomed into a nicely decorated restaurant with a friendly atmosphere and a menu full of deliciously contrasting flavours, aromas and colours. Serving good quality products and light dishes, El Buda Feliz is not your average Chinese restaurant. Don’t miss some of their most popular dishes, such as dim-sum, their Zhou Zhua Shou Gan Mian (a plateful of handmade noodles with meat, mushrooms and vegetables sautéed in the wok), or Gai Liang Ju Zi Ya (lacquered duck served in orange cream sauce dressed with green Sichuan peppercorns and basil). For many, the finest Indian restaurant in Madrid. The first thing you will notice on arrival is a lovely, cosy atmosphere that bears little resemblance to those typically over-decorated Indian restaurants. To put it in their own words used on the website, a meal at Tandoori Station is a unique journey into a world of flavours. The menu features dishes such as Tandoori Murgh (chicken marinated in yoghurt, lime, garlic and ginger), Murghi ka Vindaloo (an extremely spicy curry with exotic spices and a hint of lime, only for the bravest palates) and Gosht ka Rogan Josh (a classic lamb curry coated in sauce with spices, herbs and tomato). How many of them have you been to? All of these restaurants will lead you on a fabulous journey full of flavours, colours and contrasts.